This crazy-simple recipe is the best way I know to show off one crazy vegetable; it starts out looking like a perfectly ordinary squash, but after cooking can easily be shredded into long ribbons of "spaghetti." 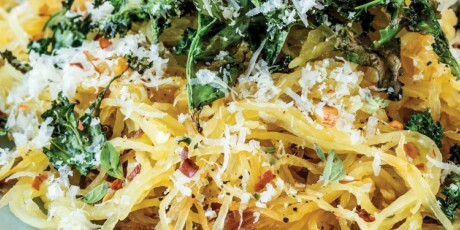 If that transformation alone doesn't blow their minds, generously topping the nest of earthy-sweet spaghetti squash with crispy kale chips and freshly grated Parm surely will. 2. Split the spaghetti squash in half lengthwise. Use a large spoon to scrape out the seeds and discard. 3. Place the spaghetti squash cut side up on a rimmed baking sheet and drizzle with 2 tablespoons of the olive oil. Sprinkle with the oregano, garlic, chili flakes, 1 teaspoon of the salt, and 3 or 4 turns of the black pepper. Turn over so they are cut side down (this will enable them to cook faster). Bake in the center of the oven until the squash flesh is fork-tender, about 45 minutes. Set aside to cool slightly, about 5 minutes. Use a large spoon and fork to scrape out the fibers from the squash halves and place them in a large bowl. Toss gently to separate the strands so they resemble spaghetti. 4. Meanwhile, wash the kale and remove and discard the stems. Tear the leaves into large bite-size pieces (about 1 inch). Dry completely in a salad spinner. Transfer the kale to a large bowl. Dress very lightly with the remaining 1 teaspoon olive oil, so the leaves are barely coated. Season with the remaining 1 teaspoon salt and 3 or 4 turns black pepper. Spread the leaves evenly on two rimmed baking sheets and roast until crispy and bright green, 12 to 14 minutes. Set aside. 5. 5. To assemble, place the spaghetti squash on a large platter and top with the crispy kale chips. Sprinkle with the Parmesan and serve.